Everyone owns a Rick and Morty Plumbus, but do you know if your Plumbus is genuine? Plumbus forgery is rampant, and the knock-offs don't provide all of the functionality of a true Plumbus. They might even be dangerous - seriously, people have been killed. Don't worry though, this baby is made of pure dingle-bop and schleem. Accept no substitutes! An officially licensed Rick and Morty Plumbus can be ordered right here for only $24.99. How they can build a product that does so much and offer it so cheaply is truly amazing. 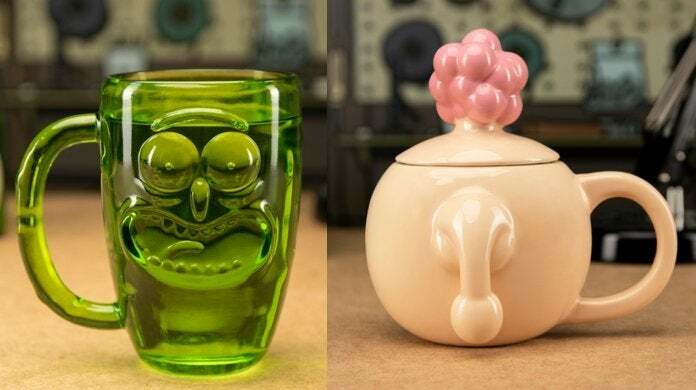 On a related note, Rick and Morty fans have two new, Adult Swim-official drinkware options, and one of them just happens to be a questionable-looking Plumbus! That's right folks - the Pickle Rick stein is available to pre-order here for $18.99 with free shipping slated for July, and the Plumbus mug is available here for $20.99 with free shipping slated for May. Quantities are limited on these, so reserve one while you can. You should also think twice about bringing the Plumbus version to work for obvious reasons. Finally, if you liked the Pickle Rick and Plumbus mugs, you might be interested in these Rick and Morty Geeki Tikis. They're a merchandising match made in Heaven. Or maybe Hell. Either way, it makes a lot of sense. 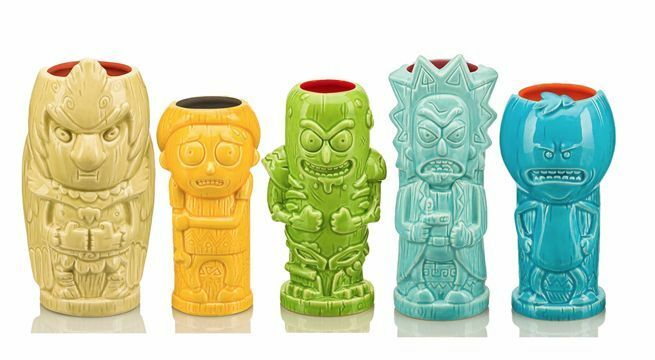 Indeed, Rick and Morty Geeki Tiki mugs are a reality, and you can order the entire lineup right here for $17.99 each. There are 10 mugs in total, and if you're wondering whether or not the collection includes a Pickle Rick Tiki mug, the answer is "yes". Just make sure to take note of the capacity of each mug as they range from 12oz all the way up to 24oz but the price is the same. However, Geeki Tikis makes a great tiki mug, so the the quality will be high on these.